We regularly read headlines like this: "2 Teens Killed When Car Smashes Into Tree." They had been at a party with underage drinking, and beer cans, still cool to the touch, were in the car's wreckage. The teens who died were in the backseat without their seatbelts on: Calvin Jia-Xing Li, 18, an outstanding wide receiver on his high school football team and Alexander Murk. Joseph Ellis, the 18-year-old driver, was a star quarterback, who broke the state record with 557 passing yards in one game. He was seriously injured but survived. "They were all really good kids, great athletes," said Monica Lewis, whose son played football with them. "And they all had really promising futures. They were all headed to college." When police arrived at the home where the party had occurred, a parent answered the door. Several teenagers were cited for underage alcohol possession. What's wrong with this picture? Parents should not be hosting parties where alcoholic beverages are served to minors. In fact, Maryland has a "Social Host Law" to prosecute parents or homeowners permitting parties with underage drinking. They are indirectly responsible for the deaths of those two teenagers. However, to date, six weeks later, no parent has been charged. Why not? Three weeks later was another headline: "Teen Driver in Fatal Crash Allegedly Reached 119 MPH." The driver, Austin Donovan Hall, lost control of the car in a 35 mph zone in Olney, MD. Shawn Gangloff, 15, was ejected and died. Another passenger, Max Dechter, 17, was severely injured. Hall pleaded guilty to a charge of vehicular manslaughter in Gangloff's death and a charge of causing a life-threatening injury (to Dechter) while driving impaired by alcohol. Prosecutors said that Hall's blood-alcohol level was .11 when he was tested at 4 a.m., hours after the accident at 1:30 a.m. on August 30. His attorney said he pled guilty because he wanted to take responsibility to honor and respect the families. Dechter was hospitalized for five weeks and was in a rehabilitation hospital for five more months. His neck was fractured and an elbow shattered. He also suffered traumatic brain injury that required him to have to learn to eat and walk again. "I had to relearn everything," he said. He was wearing a seatbelt which saved his life. Max Dechter said his message to other teens would be not to get in a car with a driver who has been drinking: "It puts others at danger and yourself at danger." 2,524 teenagers aged 13-19 died in motor vehicle crashes in 2013 . Such crashes are the leading cause of death for U.S. teens. Some 44% of those deaths were to passengers, not drivers. Teens also cause an astounding number of injuries – 292,000 were treated in hospital emergency rooms. Young people aged 15-24 are 14% of the population, but account for 30% ($19 billion) of the total costs of vehicle injuries by males and 28% of those among females. The only good news is that the number of teen deaths is 71% fewer than in 1975 when 8,748 teens were killed. There were even 11% fewer than 2012. There are three major reasons for the decline in teen deaths. First, seatbelt use by drivers rose from only 14% in 1983 to 42% for teen drivers (and 87% for adults). Second, 71% fewer teens had blood alcohol content (BAC) at or above .08 percent in 2013 than in 1982. Third, all states now have "Graduated Licensing Laws" that restrict teen driving to some degree. 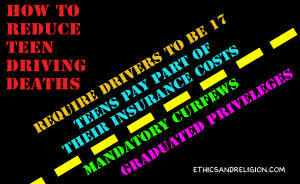 First, teens have a learner's permit, allowing them to drive only with adult supervision for some months. Stage two allows unsupervised driving, but kids must be home by 11 p.m. or midnight. Only New Jersey requires teens to be age 17 to drive. I asked what the impact would be if all states required age 17. "It would have a sweeping effect," said a spokesman for the Insurance Institute for Highway Safety. Parents: why don't you require your teen to be 17? And home by 11? 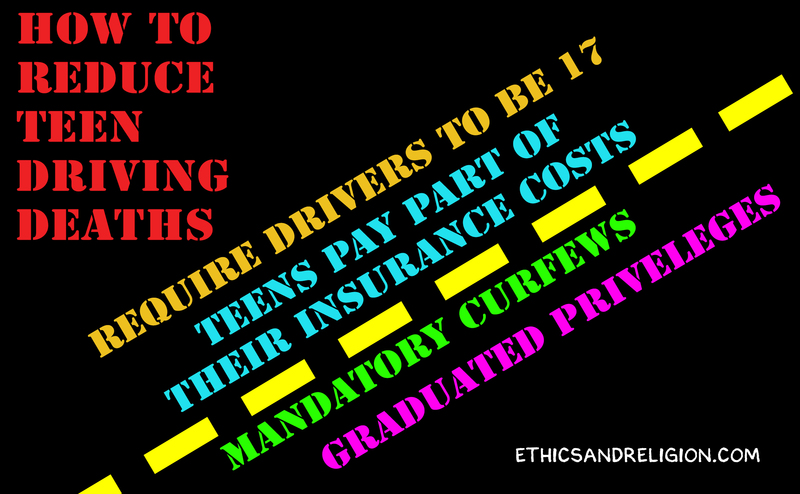 My wife and I told our sons they could not drive until age 17, and they had to pay part of their insurance costs, and had a curfew. We told them about our rules years in advance.